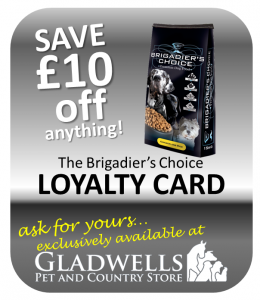 The Brigadier’s Choice Loyalty card, exclusively available at Gladwells Pet & Country Stores! For every purchase of Brigadier’s Choice premium dog food you will receive a stamp. Collect them to validate the card and use it as a discount voucher against any qualifying purchase at a Gladwells Pet & Country Store. Please ask in store for more details.